Hakuho n’a eu besoin que de quelques secondes pour sortir Daieisho par yorikiri. Le yokozuna Hakuho a fait sa meilleure impression en chargeant tel un bulldozer son adversaire ce samedi pour conserver la tête du tournoi aux côtés de Harumafuji. Hakuho a fait irruption sur Daieisho au moment de la charge, celui-ci n’a offert que peu de résistance au grand champion. Le maegashira 3 continue sa série de défaites après s’être fait sortir de l’anneau en à peine 3 secondes. Hakuho et Harumafuji partagent la tête avec un score de 7-0. Le sekiwake Takayasu suit les leaders avec 6-1 tandis que le yokozuna Kisenosato est à la traîne avec 5-2. Harumafuji a foncé la tête la première contre Yoshikaze pour le sortir en lui infligeant seulement quelques coups au cou. 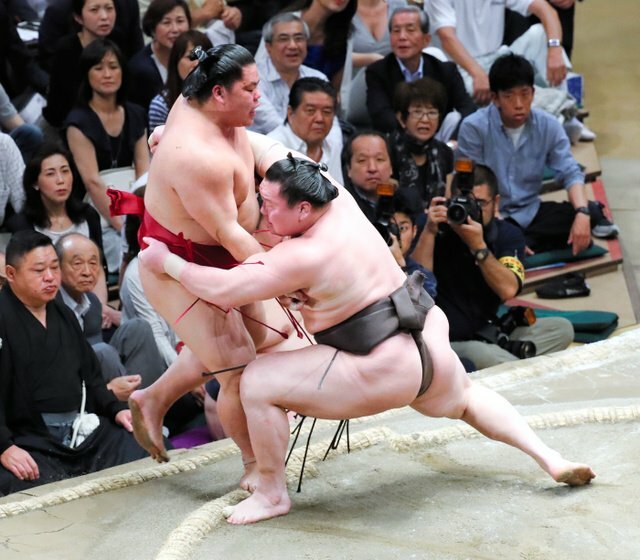 Kisenosato a été conduit sur le bord du dohyô par le komusubi Mitakeumi (3-4) mais le nouveau yokozuna ne s’est pas laissé faire et s’est repositionné au centre avant de forcer son adversaire à quitter l’anneau. Takayasu a récupéré de sa première défaite du tournoi pour obtenir une victoire par tsukiotoshi contre Chiyoshoma (1-6). 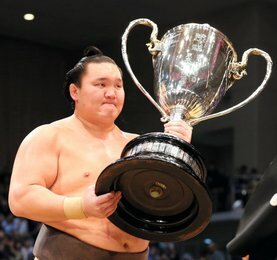 Takayasu a besoin de quatre victoires supplémentaires pour parvenir aux 33 victoires sur trois tournois nécessaires à la promotion d’ôzeki. L’ôzeki kadoban Goeido a franchi un pas de plus pour conserver son rang en s’imposant face au sekiwake Kotoshogiku. 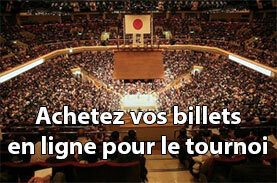 Kotoshogiku, qui a manqué un retour rapide au statut d’ôzeki lors du dernier tournoi, s’est heurté à sa sixième défaite. L’ôzeki Terunofuji a obtenu sa cinquième victoire en battant Okinoumi (1-6). Mongolian yokozuna Hakuho did his best impression of a bulldozer on Saturday to retain his share of the lead after the first week of action at the Summer Grand Sumo Tournament. Hakuho, looking to win a record 38th career title in his return from injury, got stuck into Daieisho at the charge and faced little resistance, sending the winless No. 3 maegashira sliding across the sandy surface and out of the ring in 3.2 seconds. Hakuho and fellow Mongolian yokozuna Harumafuji share the lead at 7-0. Sekiwake Takayasu follows at 6-1 and yokozuna Kisenosato is another win back in a 13-way tie at 5-2. Harumafuji followed up a crunching head charge with a couple of neck thrusts and finished off Yoshikaze (4-3) to deny the komusubi his third yokozuna scalp of the tournament. Kisenosato dodged a bullet to see off Mitakeumi (3-4) after the komusubi had threatened to bump the yokozuna out to a third defeat. Teetering on the straw bales, Kisenosato fought back and after a mid-ring stalemate huffed and puffed his way to victory, much to the delight of the crowd at Ryogoku Kokugikan. Ozeki promotion hopeful Takayasu recovered from his first defeat of the tournament to sit one win back with a tsukiotoshi thrust down win against second-ranked maegashira Chiyoshoma (1-6). Takayasu needs four more wins from his last eight bouts to meet the criteria of 33 victories over three tournaments for promotion from sekiwake to sumo’s second-highest rank. Ozeki Goeido edged a step closer to retaining his ozeki rank, turning the tables on struggling sekiwake Kotoshogiku at the ring’s edge for a fifth win. 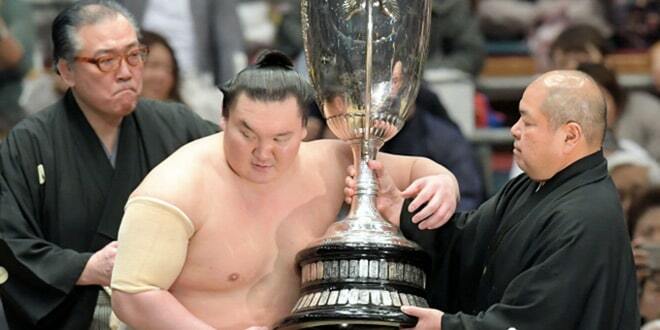 Kotoshogiku, who narrowly missed out on a swift return to ozeki at the last tournament, crashed to his sixth loss. 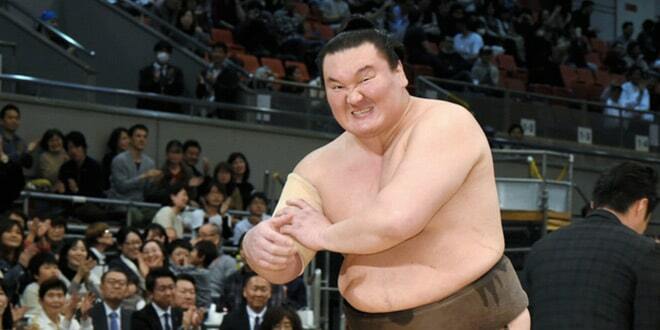 Mongolian ozeki Terunofuji cruised to his fifth win, forcing out second-ranked maegashira Okinoumi (1-6).